Everyone feels nervous sometimes - it is a natural survival instinct that helps individuals stay aware of their surroundings. Anxiety, however, is a psychological condition that is characterized by the intensified and persistent feeling of worry, tension, and nervousness. Episodes of anxiety are usually irrational, and occur even when there is nothing to provoke these feelings. These disorders include generalized anxiety disorder, panic disorder, social phobia, and obsessive compulsive disorder. 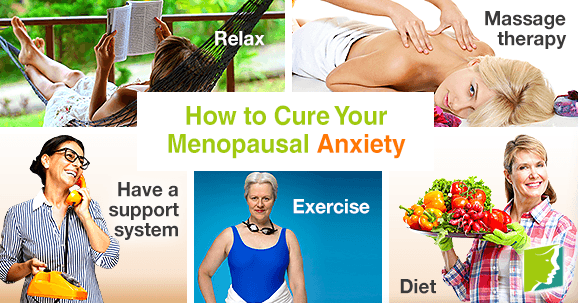 Fortunately however, there are several ways to help ease menopausal anxiety. It is important to be aware of the common symptoms of anxiety in order to determine if you are suffering from an anxiety disorder. Anxiety symptoms can be categorized into physical and psychological. Physical symptoms can include sweating, dizziness, increased heart rate, shortness of breath, muscle tension, insomnia, and headaches. Psychological symptoms consist of anything from feelings of dread and intense fear to anticipating disaster to restlessness and irritability. Anxiety is twice as common in women as it is in men, largely due to hormonal fluctuations. In fact, hormonal fluctuations are the primary cause of anxiety in menopausal women. During the menopause transition, a woman's estrogen levels rise and fall, and then stay consistently low. When a woman's estrogen levels drop, she is more susceptible to experiencing anxiety, because estrogen significantly affects the brain's regulation of mood and emotions. Additional causes of menopausal anxiety are genetics, high stress, previous emotional trauma, insufficient exercise, inadequate nutrition, and certain medications. Follow these treatments to prevent anxiety episodes during menopause. Taking time every day for yourself is integral to feeling good and easing anxiety. Taking a bath after a long day, reading, and meditating are all effective ways of relaxing the body and mind. Getting a professional massage will help reduce muscle tension. Massages also help release serotonin and endorphins, which improve mood. Talking to close friends and family can help you relax after a long day. Try to make time to see or talk to friends and family throughout the week. Having a solid support system is key to mental health. The key to reducing anxiety and releasing “good-mood” neurotransmitters, like serotonin and endorphins, is to exercise regularly. This means engaging in at least 30 minutes of aerobic activity five days of the week. Walking, yoga, and swimming are all good forms of low-impact workouts that can help ease anxiety. Exercising regularly offers other health benefits such as improving sleep, reducing tension, and lifting mood. Making simple dietary changes can be extremely beneficial to your overall health. Try to include protein, fiber, fatty acids, and fruits and vegetables into meals for optimum performance. Salmon, kale, guava, and probiotic yogurt are all healthy foods that have been known to prevent menopausal symptoms, like anxiety. Anxiety touches around 40 million Americans on average, affecting twice as many women as men. Hormone fluctuations are the leading cause of menopausal anxiety. It is important to try out different treatment options to see which works best for you. Exercising, eating healthy, and taking time to relax are all advisable treatment options for anxiety. If none of these treatments work however, speak with a therapist or doctor.